"For sale is this vintage 1963 Fender Esquire electric guitar. 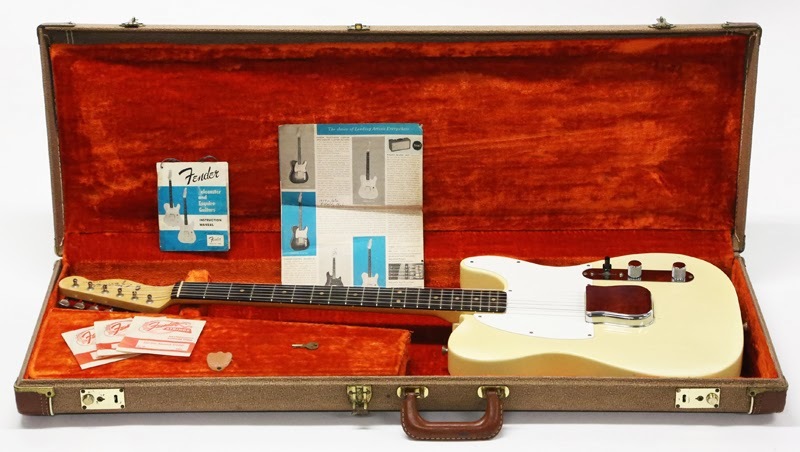 This particular near mint example, serial number 99018, is in 100% all original condition, and includes; the original Fender brown hard shell case, original case key, original ashtray bridge cover, the original owner's manual, the original catalog page featuring the Esquire, and miscellaneous original Fender strings! This guitar is much finer than those considered "closet classics," rather, this impeccable specimen looks as if it was removed from a time machine. 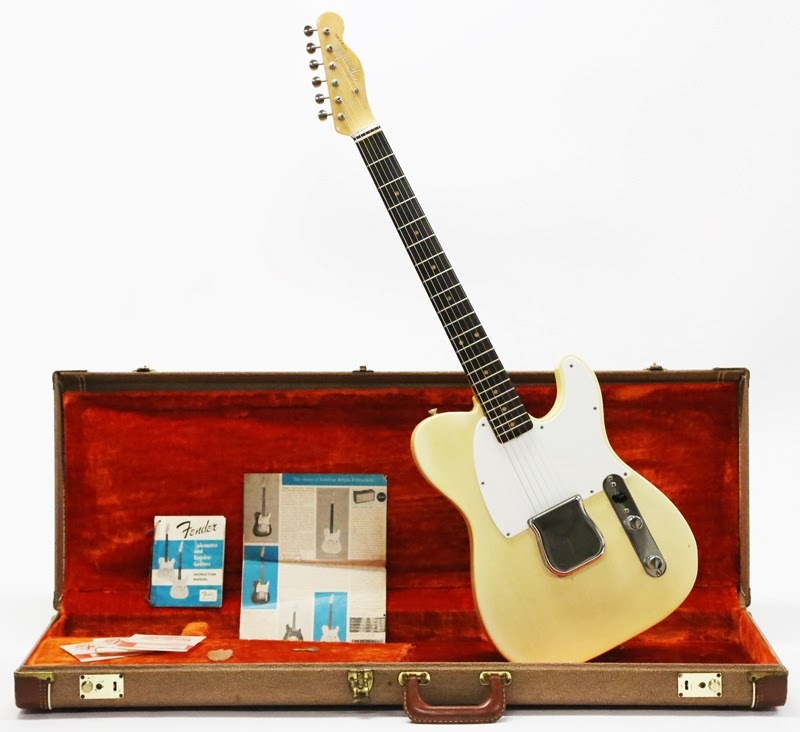 This 50-year-old Esquire is near mint with the original case, and it is truly an incredible find. From my collection to yours, I am listing this '63 Fender Esquire with No Reserve and Free Worldwide Shipping, so bid now, because the highest bidder will win... regardless of price! As mentioned, this guitar is in near pristine 100% all original cosmetic condition. Finding a vintage guitar in perfectly preserved condition is a real treasure, but unearthing an extraordinary example of an incredible model is an entirely different dream. As you could imagine, anything this well preserved would be exceedingly clean, but don't let your imagination run wild, as you can simply reference the 100+ photos to your right to view the unbelievably intact condition of this fine instrument. Fender Esquires were made with such infrequency during '62-'63 that most of the features resemble that of one made slightly earlier. For instance; this example features a highly desirable slab board fingerboard (stamped June (6) '62), though it was finally assembled in early (April) '63. This is because numerous Fender Esquire necks (a batch or so) had already been completed in '62, but it took almost a year before they were installed on corresponding matching bodies. Many are familiar with date discrepancies between a Fender guitar's body and neck, and it is very normal, however, almost a year difference is about as extreme as it gets, and serves to perfectly illustrate the rarity of this model during this era. Similarly, though a '63, it sports an original single-ply pickguard with a trussrod scoop and interesting edges remiscent of those on Musicmasters and Duo-Sonics, which is interesting as Fender was well into their implementation of 3-ply "green guard" pickguards. Both fortunately, and unfortunately, I was the first to disassemble this one owner guitar. Every screw was safely removed, and later reinstalled into it's exact original corresponding hole. The guitar was not polished and the frets were not cleaned, rather, it was merely dusted. Incredibly, it looks as if it is near new. There is no visible weather-checking anywhere on the guitar. With no playing wear on the neck, and no playing wear on the body, the only cosmetic shortcomings are those created by sitting in the same case for 50 years along with several random dings. The original nitrocellulose blonde finish is in extremely clean condition, showing no signs of wear, aside from ta small gouge from adusting the bridge saddle height without care. The neck is in perfect condition and exhibits zero playing wear on the back and none whatsoever on the frets. The frets are ineivtably oxidized and have never been cleaned. As can be seen in the photos, the guitar does not display weather-checking nor fading, and only super slight discoloration from case gassing along several edges. The original pickguard is crack-free and the original hardware is extremely clean and void of oxidation. The original single-line Kluson Deluxe tuning machines are so lustrous, it is difficult to recollect ever seeing a better looking set. All of the parts are original. The pickup works perfectly and sounds amazingly efficient and fresh. It measures at 6.53Ω. All of the corresponding original electronics also work flawlessly. The guitar weighs 7 lbs 9 oz. The neck feels simply amazing. In my opinion, the epitome of a perfect neck profile is that from a mid-'62 slab board Fender Telecaster, and this Esquire's neck is unreal and absolutely perfect. You will not feel a better neck. The Brazilian Rosewood slab board fingerboard is substantial and gorgeous. The action is low thanks to the perfectly straight neck and the original and intact fret life. The original brown case with orange interior is in correspondingly mint and clean condition. Both spring-loaded latches work like new, both of which lock without issue. Having performed a search on GBase, I can not find a single Blonde Esquire between the years '60-'66. They are becoming increasingly more rare, and hardly available, so given such, it will be very difficult to find a better example, especially with such incredible sale terms!..."